Lawsuits, unfounded claims, litigation, taxes, and other financial disasters can come when you least expect them. It’s sad but true… when you build wealth and get rich, you become a target of lawyers, the IRS and everyone that has less than you. It’s not what you make, it’s what you keep! But how do you keep it in today’s lawsuit–crazy world? Hello, I am William Bronchick, an attorney who has dedicated his life to helping Americans preserve and grow their wealth. You have probably heard of me or seen me on television shows like CNBC Power Lunch. You may have seen my name mentioned as an expert in prestigious publications like Time Magazine, the Wall Street Journal, Investors Business Daily or CNN Money Online. I have personally trained thousands of people all over the country to become financially successful. More importantly, I have helped them protect and keep what they have earned. 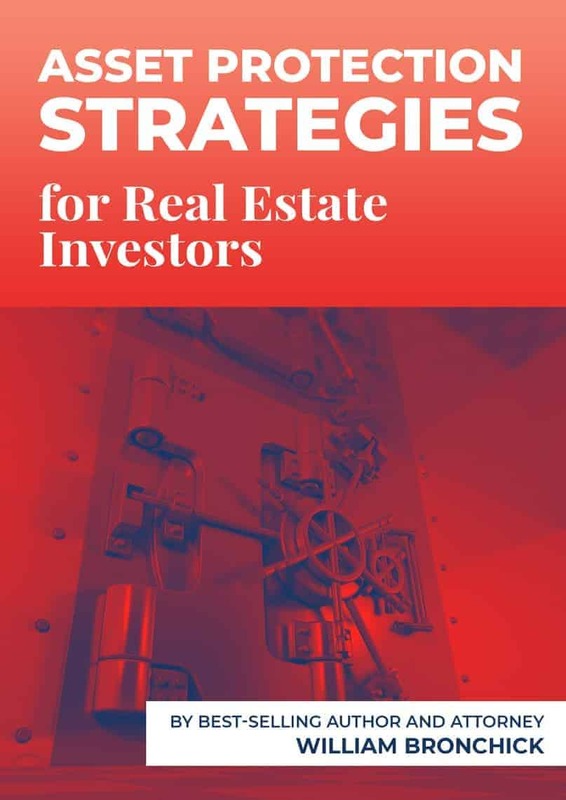 You will learn my best–kept secrets and strategies for creating, building and protecting your wealth, when you download my free ebook, "Asset Protection Strategies for Real Estate Investors". Are you a landlord now or do you have plans to own real estate in the future? If you’re ever sued, realize juries are made up mostly of tenants. They are jealous that they don’t own a house and you have several! The way jury members see it, when a landlord has been sued, it’s pay–back time! This is their chance to get even with every landlord whoever hit them with a late rent charge or made them get rid of that pet. And, consider this… most judges earn less than you. How sympathetic could they possibly be? What do think the chances are of getting a fair trial? You might as well just hand over your checkbook and the title to one of your houses – unless you know my protection strategies! 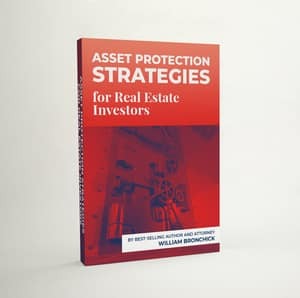 Asset Protection Strategies for Real Estate Investors is a quick and dirty guide to protecting yourself from the liabilities of real estate investing and landlording. This ebook will show you how to use trusts in conjunction with LLCs, corporations, and family limited partnerships to protect yourself, your family, and your business from lawsuits, taxes, liabilities, and other financial pitfalls. Fill in the form below and get instant download instructions. Time is Running Out - Act NOW! William Bronchick is an attorney, real estate investor, and best-selling author with over 27 years' experience. He has authored six published books (available on Amazon, etc.) and has appeared on major media outlets like CNBC, TIME Magazine, USA Today, The Wall Street Journal, Forbes, Investors Business Daily and dozens of others. 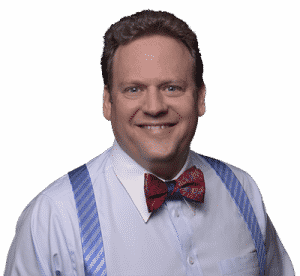 Mr. Bronchick has helped thousands of real estate investors protect themselves from lawsuits, liabilities, taxes, and other financial pitfalls of real estate through his educational books, articles, seminars, and his law practice. He is admitted before the bars of New York and Colorado and resides in Denver, Colorado. His ability to take complex legal topics and break them down into simple, actionable steps is what sets him apart in the legal community.